Why? Because it is my favorite salad dressing. I make my own and its simple. 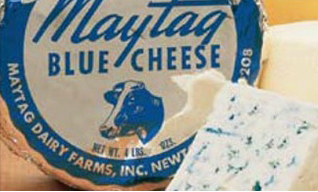 The key, which cannot be ignored is to use only the best cheese for the job: Maytag Blue Cheese. I had this delicious cheese years ago in the San Francisco Bay Area at Skates restaurant in Emeryville. They had a Maytag Blue Cheese salad that I would order with grilled salmon nuggets. Cream together the Maytag Blue Cheese, mayo and sour cream until it reaches whatever consistency you like. I like it with a little chunk, but the more you incorporate the MBC into the mixture the more flavor you get. Let it stand overnight in the fridge (if you can wait that long). If you need you can thin it a bit with a few tablespoons of cream or whole milk. Remember: this is not diet food and a tablespoon full, or three ,goes a long way. This is full flavored, delicious and needs nothing else but wonderful crisp Romaine and a delicious tomato for me to have a nice salad. Try this. You'll thank me later.